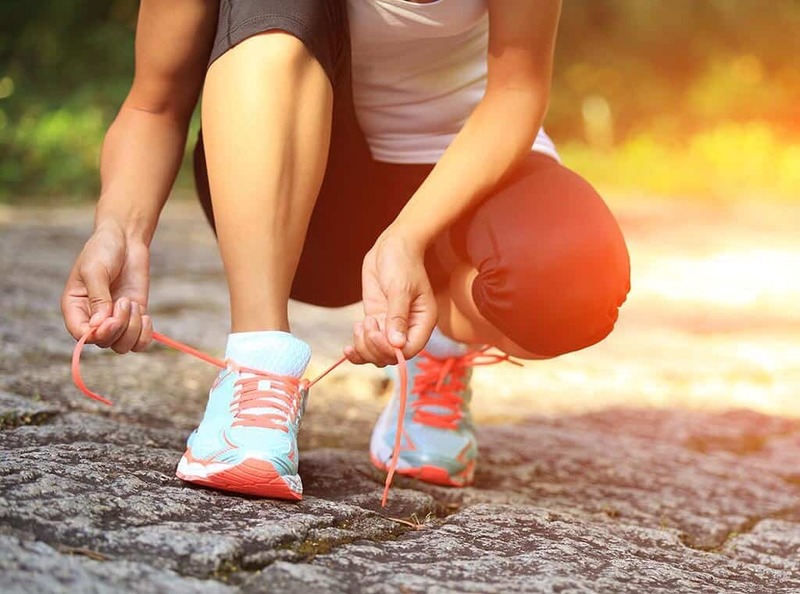 There are plenty different types of exercise shoes simply because it’s important to get the right footwear for the right activity. Likewise, when we talk about Zumba shoes really we’re referring to sneakers (or trainers) which are fit for the physical activity which the party dance incorporates. Whether you are an experienced instructor or an up and coming beginner it makes no difference, because everyone needs to wear dance sneakers that care for your feet, ankles, knees, muscles and back when you’re doing your thing. That’s why when it comes to Zumba shoes for women in particular our simple aim is to bring you the very latest and best as recommended by the experts. Our mixed team of three reviewers have been teaching and taking classes for almost a decade now so there’s no shadow of a doubt, they really know their stuff and are able to offer expert advice on which ones to use and which to avoid. Below we list and evaluate some of the best Zumba shoes based on their recent findings. 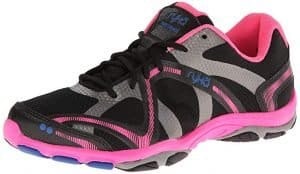 These trendy Ryka Zumba shoes for women are one of the most popular choices among enthusiasts because of the pioneering comfortable design, great arch support, heel cushioning, breathability, and much more. 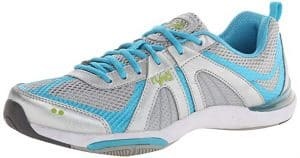 Due to features such as their Precise-Return bouncy insole and Dual-impact midsole, they are often considered as one of the best Zumba shoes and highly recommended by coaches and instructors for their ability to perform well in fast-paced high impact fitness scenarios due to the feather-light design and pivot point which allows for natural movement with ease. Whichever step you’re practicing, the Ryka Influence really is every dancer’s best friend. These sneakers add kudos to Ryka’s reputation for perfectly made comfortable shoes. They have good flexibility and a fit that conforms to your feet whilst offering supreme lateral stability and support all around. The smooth manmade soles provide plenty of traction but just enough to slide and glide. Also being one of the lightest around at only 6.7 oz they easily perform any moves you pull. 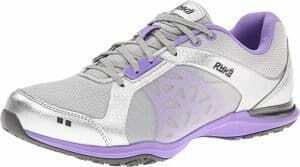 The Ryka Exertion is often rated as the best Zumba shoes through owner satisfaction surveys and fitness forums. Not only is the Exertion good for preventing knee pain, it comes with an Ortholite footbed and its inner lining is of soft textile which in turn offers great comfort and support making them especially good bunion shoes and also for those for people who need extra help with Achilles tendonitis too. These sneakers aren’t exactly cheap but they are highly recommended for any class. We seem to have more Ryka’s here than any other brand, not because we are favorable towards them, it’s because they honestly know how to make some top of the range gear and the Ryka Moxie is one of those. A well built all rounder which easily qualifies as one of the best shoes for Zumba, they offer great bounce, lateral stability and perfect grip whether used indoors or outdoors. They feature a distinct pivot point which is needed for easily completing turns and transitions; a stability heel clip and a breathable body also keeps the feet cool throughout even the longest fitness workouts. With all the added features and characteristics of perfect gym shoes, the Ryka Moxie is more than fit for purpose. All of our reviewers found that this model was true to size and fit like a glove for the 3 different sizes tested. Plus they are the lightest Zumba shoes of our selection at only 6.2 oz which is a huge bonus considering the cheap price tag. The comfort of these sneakers was throughout the whole foot from toe to heel, and stability was consistent without adding friction which may be due to the two pivot points at the front and back; everything about the Asics Rhythmic 3 spells good shoes for Zumba on a tight budget. These five star rated dedicated Zumba shoes for women are perfect for moves throughout even the most intense fitness workout. The bouncy and supportive shoe is full of patented design such as the Z-compress energy return system for reducing impact, Z-brace which holds the foot securely, and Z-slide which allows for easy slides on any surface. Theextremely light shoes weigh only 9 oz, and are made of all the high end materials such as synthetic shell and rubber sole which of course has the much needed pivot point. The Zumba Impact Max utilizes cutting edge research and technology to help perform those high-energy dance moves so you don’t fall behind all the rest in class. The well built Capezio Rockit is a hugely popular set which allows you to glide, twist, turn and spin without causing common knee or foot pains. We found that it’s well suited for those with high arches as it provides plenty of well-needed support, so may not be great for those with relatively low arches or who’d normally wear customized shoes for flat feet. These particular Capezio dance shoes may not be aesthetically suited for everyone, but certainly ,make up for looks with comfort and usability. Manufactured using mesh, suede, and synthetic they offer good ventilation and breathability. Featuring a flat boxed toe for easier toe stands, the lightweight Capezio Rockit has a split sole and pivot point outsole as it’s base. Fully loaded for a cheap price tag. Bloch dance shoes are especially good in general, but the mesh and suede Bloch Boost is flagship. It’s easy to pivot 360 degrees and allow for moves in even the most intense workouts involving jumps and kicks, slides and glides without the risk of knee injury. The split sole allows for free movement and takes away weight from the already slightly heavy 2 lbs. The Bloch Boost looks amazing and it’s performance is fit for pro’s making them a popular pair of Zumba sneakers. The New Balance WX867 is flexible and light pair of rubber soled shoes which look pretty amazing in our opinion. They provide acceptable lateral support and impact protection, and the pivot point slides effortlessly while the heel sticks to the spot. These were tested on carpet and wood floor, both of which performed with ease. We found they ran a bit small, so if buying a pair choose one size bigger. That aside overall they are cheap Zumba shoes, not the best performer of our selection but certainly worth the low price tag. We would recommend the Puma Cell Riaze for sheer looks alone, but that would defeat the objective of the review. Even so, this is one extremely comfortable design that is full of padding and well ventilated, light and very supportive. There are a couple things which we didn’t like about the Puma; firstly being that they weigh 2 lbs which is slightly more than it’s peers, and secondly the fact that it lacks a pivot point means less flexibility capability during a fitness workout. A sturdy set and slick in design make the Bloch Amalgam a very popular pair of Zumba sneakers. Weighing 2 lbs they are slightly heavier than others, and a disappointing choice not to include a pivot point, but this is reflected in the cheap price. The breathable canvas means no more smelly feet, and the huge split sole makes them a good choice for most moves performed on the dancefloor; whether you’re into Gold, Step or Toning these Bloch dance shoes should suit your needs for the money you’ll pay. You wouldn’t wear indoor soccer shoes outside on the turf – likewise you shouldn’t wear anything other than Zumba shoes when dancing to the beat. Things can get very physical indeed when you’re working up a sweat performing a jump, lunge or a squat; imagine dancing in class without flexibility or decent grip, this can lead to slips and trips which can cause skeletal or other serious back injuries. 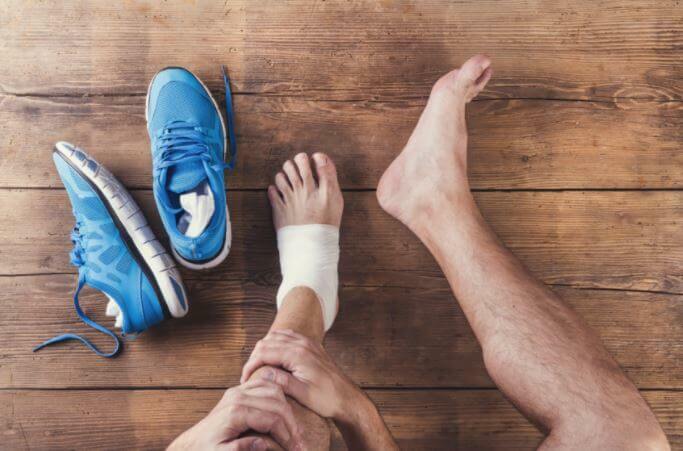 That aside it’s also possible to end up with muscle pain or sprains if your sneakers are too stiff and cannot cater for the calorie burning steps by providing the flexible movement that your feet require. Each and every time you take a step you’re relying on the grip or sole of your sneakers to keep you balanced and stop you from losing your footing. Although Zumba dance isn’t considered a sport, like with most indoor physical activities it still requires a good footing. With the frequent and physical nature of the choreography, whenever you change position it’s important to maintain balance and posture to complete the move correctly. Too much lag, under or over movements in your footing can lead to losing your balance and in turn cause accidents, slips, trips, and other forms of injury. It’s easy to lose energy through poor footwear. When following your instructors exercise routine all energy and focus should be on the moves, and not be wasted on worrying about insufficient footwear which may even be causing you to work harder, and cause long term harm rather than toning and burning calories. Confidence on the dance floor isn’t just about how good your moves are but also about how good you look. We all love to be stylish and fashionable which adds to confidence levels and in turn makes it all the more fun and enjoyable. So, with all the pretty designs and various color combinations, it’s almost too difficult not to be picky. Durable – Without being too rigid or heavy they must be durable enough to withstand intense usage for 30-60 minutes at a go. Most materials these days whether mesh, synthetic or canvas, all have their own pros and cons, but however remain in shape and supportive whilst in use. Gripping – An ideal pair of Zumba shoes should have good rubber soles which are your tread and safety assurance. This is important for not only the fast-paced party classes but also the lower-intensity routines. Flexible – Another important factor to look into while picking up the right Zumba shoes is its flexibility. Without a doubt, the best sneakers for Zumba are ones which are flexible enough for rapid movement, especially to accommodate for the more demanding classes. Certain types of dance footwear, for example, have the midsole cutaway (also known as split sole) which allow the front and back of the shoe to move independently of each other which allows for added flexibility and more confidence on the dancefloor. Comfortable – Your regular fashion sneakers will be no good here and will probably lead to sprained ankles and other injuries, especially if you already suffer from conditions such as flat feet or wear specialist footwear such as plantar fasciitis shoes. Instead, look for comfy ones that provide good arch and ankle support. For example, there is a great difference in buying a good pair of RykaZumbaa shoes compared to some iconic Converse when it comes to dance class. Light – The most highly recommended Zumba sneakers are almost always lightweight. Preferably they should weigh less than 2 lbs, but generally the lighter the better. Imagine dancing freely, exerting energy and performing fun steps; all of this shouldn’t be weighed down with heavy sneakers restricting your moves. Although running shoes are generally the lightest you can get, in this case, you may be better off avoiding them because even the best running shoes often lack important characteristics such as pivot points and split soles. Ventilation – Sweaty feet are unhealthy feet so make sure the sneakers have a good design to allow for ventilation and breathability. This is found in the form of mesh type design for the upper or whole external areas, or some kind of vent systems. Still Unsure What To Wear? Please see the below for further recommendations on the best shoes for Zumba; expert advice from an experienced instructor by the name of Coach Lana. From our recent reviews we conclude that there isn’t a single pair of best Zumba shoes because all footwear ranges from different manufacturers and brands are slightly different, but ultimately offer the same goal of being lightweight, providing support, ventilation and flexibility. Footwear that meet the above characteristics should be great for any kind of Zumba class, even for the intensity of total body transformation routines, which can be very demanding on your precious feet which in turn is primarily dependent on your chosen Zumba dance shoes. However, in genera,l you should always ensure you are happy with your footwear; don’t just make-do with whatever you have bought or whatever sneakers you found in your shoe-box. If you feel comfortable and your feet, arches and ankles in general are well supported that’s a good start at least.